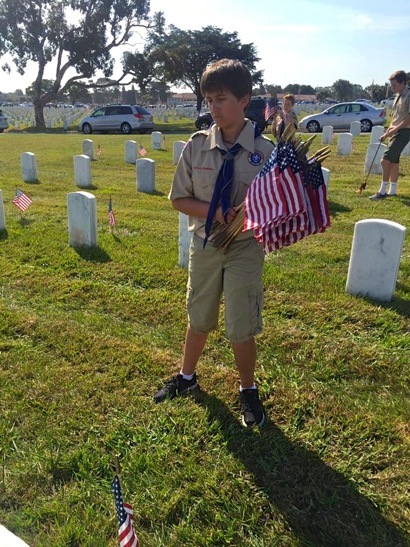 In preparation for Memorial Day, Boy Scout Troop 222, sponsored by Menlo Church in Menlo Park, helped place flags along headstones at the Golden Gate National Cemetery in San Bruno. If you’ve driven by that cemetery coming or going to the City and were curious about it, here are some facts, according to its website. The cemetery was officially dedicated on Memorial Day, May 30, 1942. Then-Attorney General Earl Warren (and later U.S. Supreme Court justice) was keynote speaker at the ceremony. Over the years, several attempts to expand Golden Gate National Cemetery were met with resistance from local residents, so it has remained at its original 161 acres since 1941. Burial in a national cemetery is open to all members of the armed forces who have met a minimum active duty service requirement and were discharged under conditions other than dishonorable. A Veteran’s spouse, widow or widower, minor dependent children, and under certain conditions, unmarried adult children with disabilities, may also be eligible for burial. Fifteen Medal of Honor recipients are buried at Golden Gate as is Admiral Chester W. Nimitz. Additionally, 24 African-American sailors who perished while loading Liberty ships in the Port Chicago incident on July 17, 1944, and whose remains were subsequently unidentifiable, are buried as Unknowns in Section P.